The tough but flexible Flexi-Coil ST820 precision tillage tool is ideal for a variety of conditions. The flexible frame and floating hitch allow the ST820 to closely follow the contours of the land, while reducing stress on components and providing a long, trouble free life. The centre section and wings of the ST820 are constructed with diagonal hinge lines. High-density polyurethane discs cushion the frame and absorb movement as the machine flexes. As a result, the frame lasts longer because it flexes with the contours of the land instead of placing stress on the frame. Tillage and seeding depth is conveniently maintained through a single-cylinder depth control for both 3 and 5 section machines. Depth for the entire machine is set at a single point to provide accuracy, reliability and low maintenance. A mechanical linkage translates the hydraulic lift to the walking axles so the depth is maintained across the machine. Superior flotation provides stability in field and transport positions. Parallel lift between the front casters and the rear walk beams keep the frame level, regardless of depth. High frame clearance (0.8 metres) and rear-placed walking tandem wheels let residue flow through the machine without plugging. 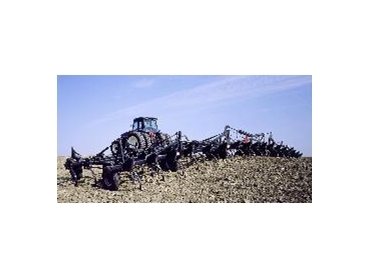 The ST820 precision tillage tool is available in three or five-section models with 183mm, 229mm or 305mm row spacing. The three-section model ranges in width configurations from 7.6m – 13.4m. Depending on the working width configuration, the ST820 ranges in transport width from 5.7m – 6.6m and ranges in transport height from 3.8m – 5.5m. The five-section model ranges in width configurations from 13.1m – 18.9m. Depending on the width configuration you choose, the ST820 ranges in transport width from 5.7m – 6.6m and ranges in transport height from 4.2m – 5.1m. Options for the ST820 include an air distribution package for fertilising and seeding, field hitch mounts for air-carts, mounted harrows, mounted press wheels, mounted press wheel scrapers, single or dual end-markers, and a rigid-mount single point tillage hitch.